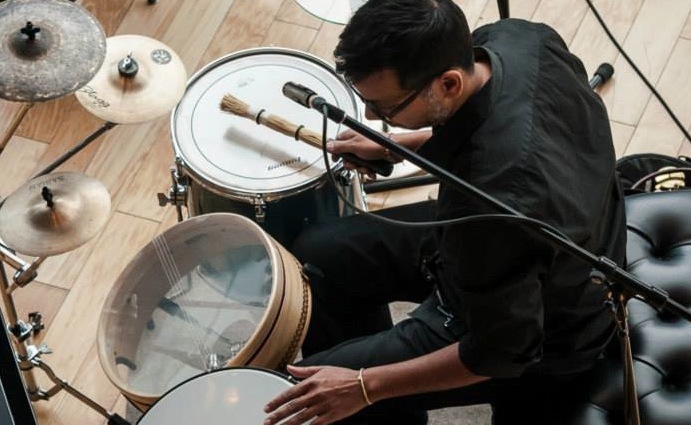 On this episode of The Night Shift, I had the pleasure of chatting with experimental percussionist, sound designer, world traveler and curry wurst aficionado, Debashis Sinha! Deb has just released his latest album, The White Dog, so we talked about how this new album is the beginning of a new chapter of analyzing how people are telling stories in sound and media, exciting new collaborations with the fantastic singer-songwriter Leela Gilday, thinking about how cities potentially operate as a being with consciousness and their drive to be immortal, crossing the divide between time, the environment and the dance floor with the harmonium, exploring the dangerous possibilities of free music with the IMA Ensemble on 2006’s criminally underrated ‘bad monkey bad bad monkey’, being uplifted by the spiritual warmth of Superorganism and Prince Nifty, & TALES ABOUT MUSIC, PASSION AND EXERCISE! Note: due to some unfortunate technical difficulties, our conversation ends abruptly before the Pan African Orchestra song, but they’re still plenty of saucy jams afterwards that will keep you in an electric mood!